"I had many teachers that were great, positive role models and taught me to be a good person and stand up and be a good man. A lot of the principals they taught me still affect how I act sometimes and it's 30 years later." 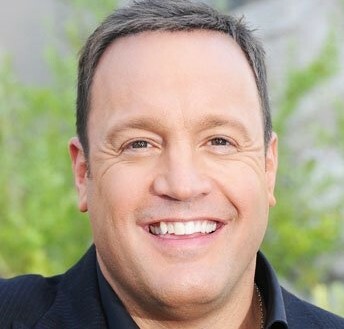 Kevin James was born on April 26 1965 in Mineola but was raised at Stony Brook,New York both on Long Island.He is an American comedy actor,writer and producer.His full name is Kevin George Kinipfing.His parents are Janet and joseph Valentine knipfing Jr, .Janet is a homemaker and also work in chiropractor's office while his father Joseph owns an insurance company.James is of German descent.He have one brother whose name is Gary Joseph Knipfing who is mainly known as Gary Valentine.He too is a comedy actor. He also have one sister named leslie Knipfing.He was raised Catholic. James attended Ward Melville High School and was graduated from there.He then joined State University of New York at Cortland but he didn't graduate from there. Since 1989,he started presenting himself as an stand-up comedian.he made his first debut on Long Island at East Side Comedy Club.This club was managed by Richie Minervini.He then apperaed in several shows including The Tonight Show with Jay Leno,Late Show with David Letterman,Late Night with Conan O'Brien,Dennis Miller Live,The Late Late Show,The Roise O'Donnell Show,The Ellen DeGeneres Show and Live with Regis and Kathie Lee. After this numerous of show he gained his popularity.Due to her popularity he was ranked 89th by Comedy Central as top 100 Greatest Stand-up Comedian.He also have worked with Just for Laughs at their annual comedy festival which was held in Montreal,Quebec.After the show he was also seen as the guest star on Just for Laughs.In 1991 he did his first televisio job at The New Candid Camera.He improved his comedic skill in there.He used to pull pratical jokes on unsuspecting people.From 1994 till 1996 he also became MTV sports show Sandblast announcer.He also was the guet star on Everybody Loves Raymond. He then starred as Doug Heffernan who is a middle class parcel delivery man who works for IPS.In movie he is marred to Leah Remini as Carrie.The couple livers with their father-in-law.For his role,he was nominated for awards.In 2005 he did his debut film Hitch which is a romantic comedy movie.Will Smith and Eva Mendes also was starred in this movie.He then acted in Grilled with his co-star and friend Ray Romano. He also have voiced in Monster House and also Barnyard which both are animated movies.He then with Adam Sandler worked in movies I Now pronounce You Chuck and Larry,You Don't Mess with the Zohan and paul Blart:Mall Cop.He then apperaed in movie Grown Ups which was a sucessful and a hit at box office.He then acted in comedy-drama The Dilemma with vince Vaughn as a lead role.They both also worked in Zookeeper which was written and produced by him.He then acted in Here Comes the Boom which is an mixed martial arts comedy movie.He then produced Dusty Peacock with her brother Gary Valentine in July 2009 on Crackle. James won NRJ Cine Award and was nominated for Teen Choice Award for movie Hitch in 2005.In 2006 he was nominated for Primetime Emmy Award as outstanding actor in comedy on movie The King of Queens.In 2008 he was nominated for Razzie Award.He was also nominated for EDA Special Mention Award for movie paul blart:Mall Cop in 2009. In 2013 he was nominated for Grace Award. He got married to Steffiana de la Cruz who in 2004.She is an actress.They got married in California.The couple had their first daughter named Sienna Marie in 2005.Their second daughter was born in 2007.Her name is Shea Joelle.The couple also have a son named Kannon Valentine in 2011.James is a close friend to Bas Rutten.He was a MMA fighter but is retired now. James is 5 feet 9 inch tall.He have got ligh brown hair colour.He is now 49 years old.His zodiac sign is Taurus.He holds American citizenship.He belongs to German ethnic background. His net worth is about $80 million.